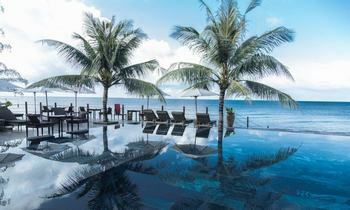 Phu Quoc and Nha Trang are two favorite sea paradises in the south of Vietnam where tourists come to enjoy their summer vacation. 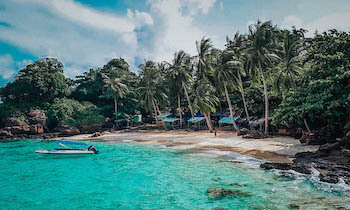 Many tourists choose to visit Phu Quoc after enjoying the wonderful days in Nha Trang, but some of them are wondering about how to get to Phu Quoc. So, today we gladly introduce you the sufficient way to travel to Phu Quoc from Nha Trang. Nha Trang is a coastal city located in Khanh Hoa province, Central Vietnam. Nha Trang is the tourist attraction with almost all types of tourism from ecotourism, cultural tourism to spiritual tourism, etc. 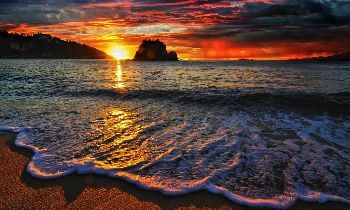 Tourists can have a lot of options to explore Nha Trang such as visiting the vibrant city of Nha Trang or coming to beautiful beaches, deserted islands, famous sacred temples. Arriving in Nha Trang, visitors also have many options for entertaining such as Vinpearl Land recreation and recreation area, Institute of Oceanography, Po Nagar Tower, Thap Ba hot spring, beautiful islands of Hon Mun, Hon Mot, Hon Tam, and Long Son Pagoda, etc. 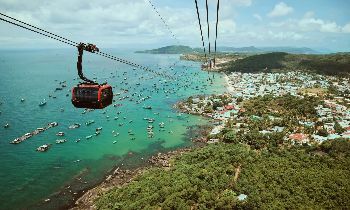 In addition, visitors can go to tourist destinations near Nha Trang such as Yen Island, Monkey Island, Binh Ba Island, and Binh Hung Island, Yangbay Waterfall, Ninh Van Bay, Phong Van Bay, etc. Traveling to Nha Trang, tourists can enjoy delicious specialties such as seafood, fish ball noodle, banh can noodle, Cau Dua duck, etc. 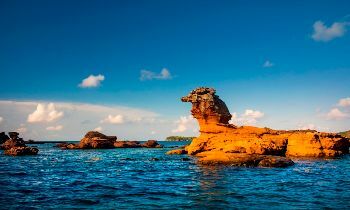 Meanwhile, Phu Quoc is an island located separately from the mainland, tourists can only access the island by boat, canoe or plane. 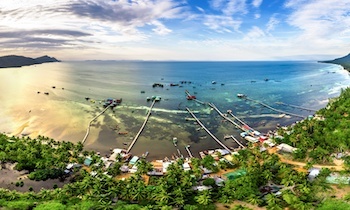 If tourists choose Phu Quoc as a place to travel, tourists can have a chance to visit plenty of tourist destinations in Phu Quoc such as pepper gardens, fish sauce production houses, pearl production facilities, beautiful beaches such as Bai Sao, Bai Dai, Suoi Tranh, Dinh Cau, relics of Phu Quoc prison, Nguyen Trung Truc temple, Ganh Dau cape, Hon Thom, Da Ban stream, Coi Nguon museum, Ham Ninh ancient fishing village, Bai Khem etc. Speaking of Phu Quoc specialties, Phu Quoc features numerous delicious dishes, especially seafood dishes such as herring salad, Ham Ninh crabs, jumping snails, grilled fish and so on. 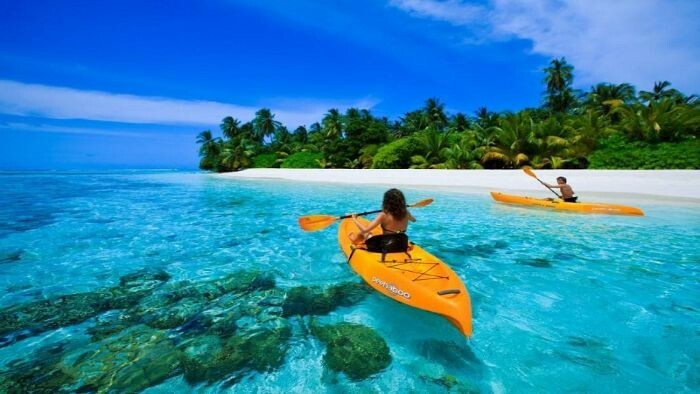 If you have just had the wonderful days in Nha Trang, and expect to lengthen your vacation in Phu Quoc, the best way for you to travel from Nha Trang to Phu Quoc is by plane. 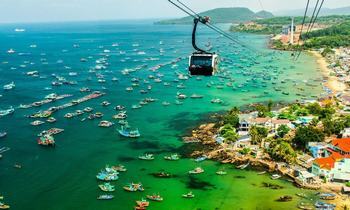 It is considered the quickest and most convenient way to get to Phu Quoc. First of all, you have to catch a taxi from your hotel to Nha Trang airport, you should book a ticket in advance, it is possible to ask your hotel’s receptionist to book a ticket online, the ticket price varies from $50 - $340 depending on the time and class. You will take 2 hours and 40 minutes to get to Phu Quoc International Airport from Nha Trang. If you want to feel the life rhythm of Vietnamese people in each land you get through, you should travel to Phu Quoc by bus. From Southern Nha Trang bus station, you have to catch a Nha Trang-Dalat bus with the price from $4 to $6. The distance between Nha Trang and Dalat is about 140 km, and it takes 4 hours to get to Dalat and the landscape along the road’s side is truly breathtaking. The bus will depart at Southern bus station every 4 hours, so you should adjust your time not to wait for the bus for too long. Then, you continue to catch a bus from Dalat to Ho Chi Minh city, it takes 8 hours on the bus to get to Ho Chi Minh city with the ticket price from $8 - $9 on the way of over 300 km. The bus will drop you at Mien Tay bus station, from there you again jump on a bus to Ha Tien. The road from Ho Chi Minh City to Ha Tien is about 310 km, and you will take 7:50 to move, the bus price is $7. Taking a ferry from Ha Tien to get to Phu Quoc island, the ferry ticket price is about $10 - $18 (VND 230.000 - 400.000) and it takes 90 minutes to get to Bai Vong port on Phu Quoc island. 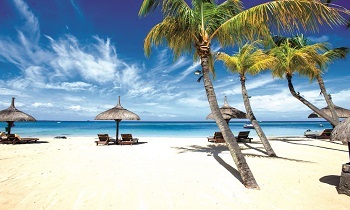 Finally, you also get to the beautiful island to enjoy the landscape and relax on the romantic beaches. If you want to experience the different means of transportation in Vietnam, this option will bring you a great experience in your Nha Trang - Phu Quoc trip. From Nha Trang train station, you will take 7 hours and 47 minutes to get to Ho Chi Minh city on the track of 411 km long, the lowest train ticket is 200.000 VND and the highest train ticket is 400.000 VND. Then, catching a taxi from Ho Chi Minh train station to Mien Tay bus station, it is just 30 minutes to get there. From Mien Tay bus station, you have to catch a Saigon - Ha Tien bus with the price of $7. Taking a ferry from Ha Tien to get to Phu Quoc. 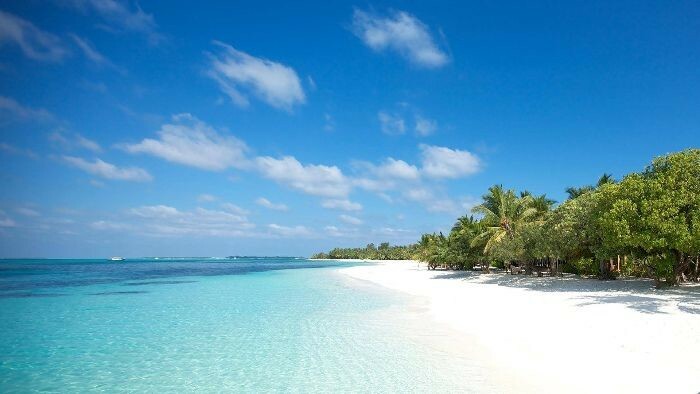 Finally, you also get to the beautiful island to enjoy the landscape and relax on the romantic beaches. 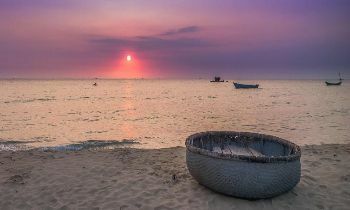 With this suggestion above, we hope that you have a wonderful and safe trip to Phu Quoc from Nha Trang. If you have any question about this post, don’t hesitate to contact us. Thank you!